The numerous temples of Tamilnadu built by the Pallava, Chola and Pandya kings and dating back 1500 years, provide us a glimpse into Tamil history. Temples older than these have perished as they were basically built of brick. King Mahendra Varma Pallava (6th Century AD) is credited with constructing the first stone temples. The inscriptions in some of these temples shed light on their importance in ancient Tamil society. Temples often served as a gathering place for people from all walks of life, where important social and political issues could be discussed and debated. They also served as nurturing grounds for the fine arts of painting, sculpture, dance and music. During times of emergency or natural disasters, temples also became make shift hospitals. An analysis of the stone inscriptions and ancient literary works yields a deeper understanding about early Tamil society, politics, geography, agricultural practices, tax systems, customs and traditions. On the basis of their architecture, temples can be classified into three broad types– cave temples, monolithic temples carved out of a single rock, and structural stone temples. 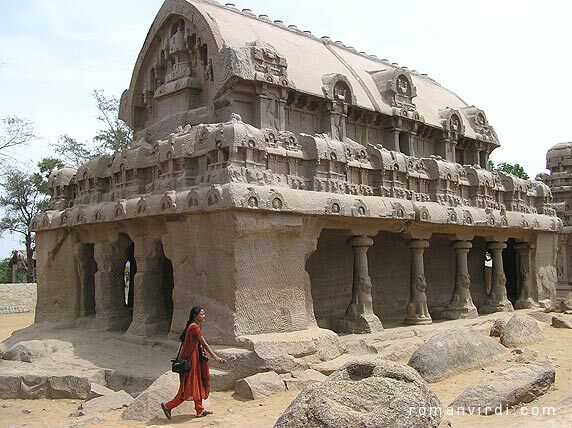 One can come across all the three types of temples (Mahishasuramardhini and Varaha cave temples built after the reign of Mahendra, the monolithic five rathas, and also other structural stone temples) at Mamallapuram, which was also referred to as Kadal Mallai in ancient literature. 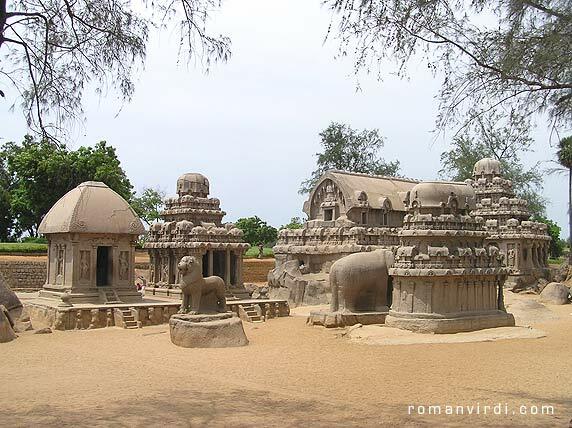 Most of the temples found in Mamallapuram were built by Rajasimha. 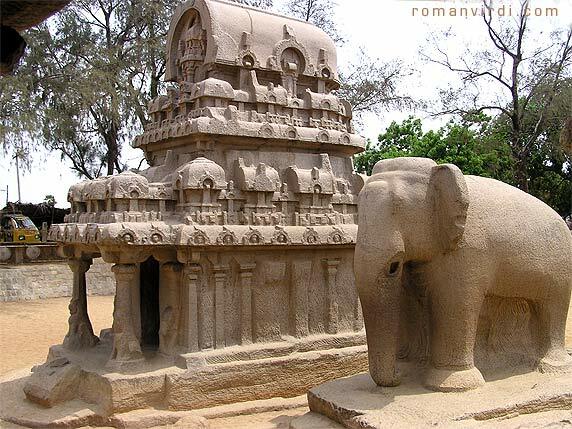 The five rathas were initially thought to be the work of Mahendra's son Narasimhavarma Pallava. But recent studies have proved that the five rathas were actually built by Rajasimha. In his book titled "Adhyanthakamam", Dr. R. Kalaikkovan, Director of the Dr. M. Rajamanickanar Center for Historical Research, gives detailed evidence that proves that the five rathas were built by Rajasimha. Other temples built by him in and around Kanchipuram, bear testimony to Rajasimha's skill and ingenuity. He experimented widely with various temple architectural concepts and introduced numerous inventions. A study of the temples built by him is in fact a study of the evolution of temple architecture. The nomenclature of the buildings is unfortunate. They are called rathas (pancha rathas means "five chariots"), and named individually after Draupadi and the Pandava brothers, although they have nothing to do with temple carts or the Mahabharata. It would be better to call them vimanas and just number them 1 through 5, but the popular names have stuck. Four of the five, namely the Draupadi, Arjuna, Bhima and Dharmaraja rathas, stand in a single row facing west. The fifth Nakula-Sahadeva ratha, faces the south, and stands apart with its side facing the other four rathas. The Draupadi ratha, the first ratha on the premises has a hut styled vimana – the simplest form of vimana, with a square base. The Arjuna ratha is a two-tired temple, with a square section in both the tiers, an octagonal shaped "Griva" (neck) and "Sikara" (head). "Karnakutas" (a hara structure kept at four corners above the roof of the first tier) and "Salas" (in the form of a boat or a bullock cart placed at the center on all four sides), have been introduced in this temple. The "Karnakutas" and the "Salas" above the roof are together called a "Hara". Another innovation in this temple is the lower tier, which starting from the basement is split vertically with projections at equal intervals. These projections divide the structure into compartments called "Bhadras" with depressions in between. The Bhima ratha is a single-tired structure with a rectangular base. The top portion of the temple is oblong like a tilted boat similar to a "Sala". This type of vimana is called "Sala Vimana". Another innovation in this temple is the modification of "Nasikas". The various forms of "Nasikas", described in the texts are found in this temple. The Dharmaraja ratha is the tallest of them all with three tiers. The architecture of this temple is also very different from all the other temples. The ground floor of this temple has pillared entrances on all sides. The second and the third tier has Garbhagriha and parapet wall with space in between them. The "Hara" structure in this temple has a new component – the "Panjara", between the "Karnakutas" and the "Salas. The "Panjara" is in the shape of a wagon-top with the longer portion to the sides as opposed to the "Salas" which have the longer portion in the front. The placement of an elephant next to the Nakula-Sahadeva ratha is significant. One can find similarities between the back of the ratha and the elephant. This type of vimana is called the "Gaja-prishta Vimana" ("Gaja" means elephant and "prishta" means back). This ratha is also two-tiered. On the front side, the "Shikara" of this temple has a miniature replica of the vimana projected out. Rajasimha's innovations add to the beauty of these monolithic structures. In the dharmaraja ratha, above the icons, inscriptions have been carved on the walls. These inscriptions are in the "Pallava Grantha" script. The inscriptions in Dharmaraja ratha contain "birudas" of a king. 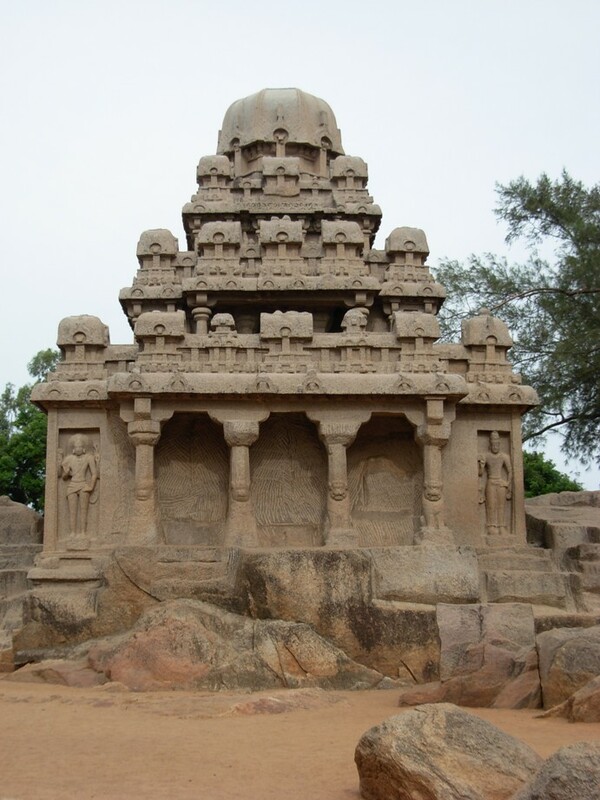 The similarities between these "birudas", and the ones found in the Kailasnatha temple at Kanchipuram and the Panaimalai temple, both built by Rajasimha, leads one to conclude that the Dharmaraja ratha was also built by Rajasimha. The "birudas" in the Dharmaraja ratha include the Adhyanthakama (one who has endless desires – it was King Rajasimha's main name), Bhuvanabaajana, Narasimha, Mega, Nayanamanohara, Sarvathobhadra, Mahamalla, Ranajaya (one who is victorious in battle, another frequently used title of Rajasimha), Paraapara and Para. Out of these, Adhyanthakama and Ranajaya must have been important "birudas" of the king and they have been inscribed at prominent locations. Numerous sculptures can be found in the Draupadi, Arjuna and Dharmaraja rathas. The Draupadi ratha is infact a temple of the Goddess Durga or a "Kotravai" as she was referred to in ancient times. The sanctum sanctorum of the vimana contains the Goddess "Kotravai" (Durga) in a standing position with her attendants. Below her to the left, a devotee prepares to cut off his own head as a sacrifice to the goddess. To the right, another devotee is cutting various body parts as a sacrifice to the goddess. These horrible rites were prevalent among a sect of Hindus called the "Kabalikas". Even the "Dwara palikas" guarding the doorway are aspects of the Goddess. Even though they are essentially feminine, their valor and "Gambeera" have been brought out by their posture and in the way they wield their weapons. The Arjuna ratha contains figures of both deities and common folk. The "Arthanareeswara" on the south wall, exemplifies the well-developed craftsmanship of the Pallavas. The sculpture strikes the correct balance between dignified masculinity (the twist in the eyebrows, the holding of hands) and graceful feminity (the slight raise of Uma's hips). The sculpture of two ladies on the south side of the back wall is another masterpiece. The lady on the left points out someone to the lady on the right. By studying the facial expressions of the lady on the right – a mixture of shyness, eagerness and joy, one can safely perceive that the lady on the left is pointing out the lover of the lady on the right. She is too shy to look at him directly, yet cannot restrain herself from glancing at him sideways. The sculptures are breathtakingly real and artistic. The Dharmaraja ratha also contains many sculptural masterpieces on all its tiers. Various puranic themes revolving around Siva,Vishnu and other deities are are depicted in the various icons. There are also sculptures of devotees and common folk. On the ground floor, one finds sculpture of a king. The third floor sanctum sanctorum contains the deity of "Somaskanda" (Siva and Parvati seated with the child Muruga between them), with Brahma and Vishnu standing on either side. 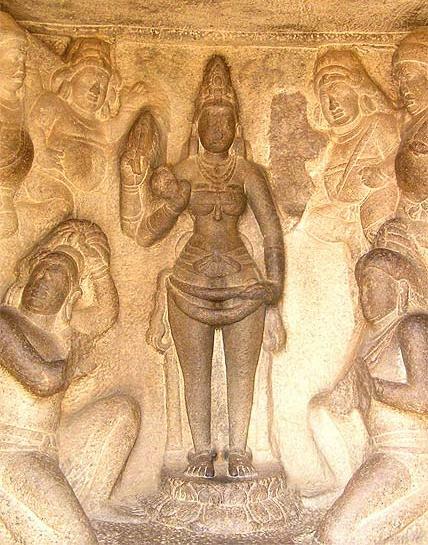 The sculptures provide details of the fashion and accessories of the Pallava period. Most men wore only a loin cloth, while others wore a cloth around their waist that covered their thighs or came up to their knees. Rich men or royalty wore silk dhotis which covered their legs. Some men and women draped a long piece of cloth around their shoulders, similar to the sacred thread worn by "Brahmins". The saree was not in existence in those days. Breast bands were in fashion among women. Both men and women wore various kinds of necklaces. They either left both the earlobes elongated or wore earrings of palm-leaf or metal on either one or both ears. Bangles made out of metal or sea-shells adorned their wrists, while "Dhandais" (circular bands) encircled their legs and arm-bands and circular bands - "Tholvalai" rested on their shoulders. Men wore the "Udharabhanda" – an ornamental band just above the stomach. Persons of royal lineage wore crowns, secured tightly to their heads by the "Netri-pattam". Nose-pins were not prevalent. This article just skims the surface of the ocean of Tamil art, architecture and history. The details of each ratha are enough to fill the pages of many books and even then we cover only one temple complex. There are about 30,000 temples in Tamilnadu, each of them a treasure trove of historical knowledge. Monuments of great artistic value, these temples speak of the greatness of the bygone era. 'Architectural Traditions and Innovations of Tamils' by Dr. R. Kalaikkovan; varalaaru.com, issue 6.